Cheryl Silcox, in White Mountain, Alaska, enrolled in CCS 693 - Cultural Atlases as a Pedagogical Strategy at the University of Alaska Fairbanks Cross Cultural Studies. She has given permission to share this lesson plan on the ANKN website. Identifies types of social groups (i.e. family, clan, tribe, village, neighborhood, and community). Participates in some form of visual arts activity. Engages in purposeful writing for specific audiences (e.g. stories, reports, letters, journal entries). Participates in teacher-led digital communication project (i.e. email another class, Audio/ video conference, web based collaboration). Student participates in a collaborative class project while: asking questions, making observations, and gathering information on a level that allows for results to be represented in a meaningful format that can be shared with others. We can conduct investigations to learn more about our environment by asking questions, making observations, gathering information and/or results, and presenting results. Results from investigations can be shared in different formats such as reports or oral presentations. When information is gathered during an investigation it can be categorized as opinion or fact. What steps can take place during an investigation or major project? How can we involve our community and sense of place in the learning process? How can we share our results in a meaningful way with our community and others? Make a copy of the USGS topographic map(s) of the area you wish to make a three-dimensional map. You may need to enlarge the USGS map in sections so that it matches the size of the 3-D map you wish to make. These contour lines can then be cut out from the paper map (starting from the bottom or lowest level contour line) and traced onto cardboard. Another way to transfer the lines to cardboard is to push a pin through the paper along the contour lines and into the cardboard – this allows you to start with either the lowest or the highest elevation line. Before using box cutters or scissors to cut cardboard be sure to demonstrate safe use of these tools – esp. with younger students. It’s usually best to glue-as-you-go by cutting out one traced elevation piece and then gluing it to the next level that is cut out for each area of relief. Often times you will need a stack of heavy books to weigh the pieces together while the glue is drying. As you complete areas of relief, you can glue them directly to the board that is being used for the 3-D map. Once all of the pieces are in place, you will need to apply a layer of spackle to create a smoothing effect to the layered topography. This is best applied with putty tools but most kids like to just apply it with their fingers. The spackle will usually dry overnight. Paint can now be applied using the original USGS map for color identification. Google Earth is a web-based program that can also be helpful during this process. Details to this process can be added for quite some time. After the map is painted, dry, and ready for display, you are ready to begin the next step. 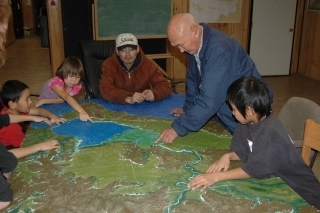 Using correct protocols for your community, invite elders and other community members to share their knowledge with the students. Ask permission to take notes and/or photographs, and use a tape recorder, or video recorder. Preset a topic for discussion but also allow for any other topics to be discussed. Possible topics may include: How Have Things Changed, Where Have You Been, Climate Change, Memories on the Land, Experiences in the Area, Sharing Culture, Survival, Sense of Place, Foods, Wildlife, Topography, Weather, etc. Prepare students ahead of time by giving them time to create meaningful and on-topic questions. Allow for at least an hour per visit. If possible, take detailed notes during each visit. Type the notes into a booklet form. Allow those involved with discussion to review the content of the booklet. If wanting to include photos, make sure to ask permission of those photographed. Display the booklet alongside the 3-D topographic map and make the booklet available to those quoted and to the students involved. You can allow for further corrections or additions to be made as time permits. If possible, ask permission for the documented knowledge to be shared with others. This can be done via a website, through the Alaska Native Knowledge Network (ANKN), with the Northwest Regional Educational Lab (NWREL), through a conference presentation or journal article, and/or many other examples.